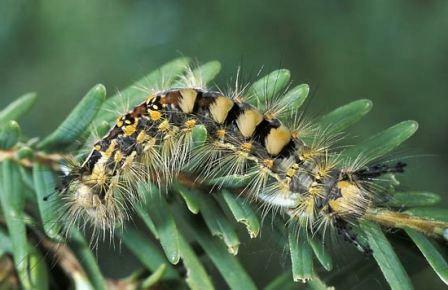 Region: This Caterpillar is found in western North America with a similar species in the East. Life cycle: This insect produces one generation each year and overwinters in frothy white egg masses on trees. Physical Description: This 1 1/4 inch long caterpillar is a strange looking, hairy insect. It has a bright red head with two hornlike tufts of long black hair. Its primary colors are brown with yellow and black longitudinal stripes. The adult moth is gray with dark wavy bands and a wingspan of 1 1/4 inches, the female is wingless. The eggs are laid in frothy white egg masses on the females cocoon and covered with hairs. Feeding characteristics: This pest attacks apple, apricot chrysanthemum, geranium, German ivy, hickory, horse chestnut, peach, pear, plum, rose, and quince by skeletonizing leaves and form silken cocoons on the bark. Controls: Pick off the infested leaves and groups of larvae, and destroy them. Scrape off the masses of eggs or paint them with creosote. The masses are easy to find. They are about an inch long and lathery. Natural predators of this caterpillar is various Trichogramma Wasps and birds. For serious infestations, apply Bacillus thuringiensis to the larvae and eggs.